Le Blanc is about 8 years old and came into CPL care as a stray, having been on the streets for quite some time. 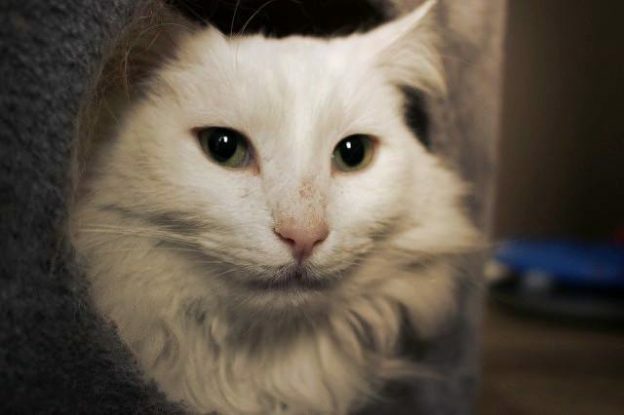 Le Blanc has taken a while to settle at the cattery, being both deaf and shy. He prefers the safety of his box most of the time but is very cuddly and affectionate once he allows himself to be coaxed out. Being deaf, Le Blanc will be best as an indoor-only cat. He will suit a quiet home and a patient new owner – getting used to interacting with a deaf cat can be a challenge. He will need regular grooming, which he loves.